This is a FREE online repository of protein-ligand complexes which have been structurally resolved and thermodynamically characterised. For SCORPIO home click here. Protein-ligand interactions are involved in virtually all biological processes, including substrates binding to enzymes, antigens binding to antibodies and antagonists binding to receptors. Understanding protein-ligand interactions is therefore fundamental to the life sciences. The aim of this database is to provide access to complete sets of thermodynamic data for protein-ligand complexes that have had their structures resolved. Hopefully this will be useful to anyone trying to relate structure to thermodynamics. This database differs from other databases linking binding affinities with structures in that it provides all the thermodynamic parameters of binding. Gibb's free energy (ΔG), the enthalpy (ΔH) of binding and the entropy (ΔS) of binding, and when available the heat capacity (ΔCp) of binding. This is achieved by only including thermodynamic data derived from isothermal titration calorimetry (ITC). Furthermore ITC does not rely on the van't Hoff equation to determine the ΔH: therefore it is the technique which provides the highest quality thermodynamic data. For a review on ITC click here. The database currently holds 29 different proteins, 176 ligands and 90 unique protein-ligand complexes with both thermodynamic and structural data. 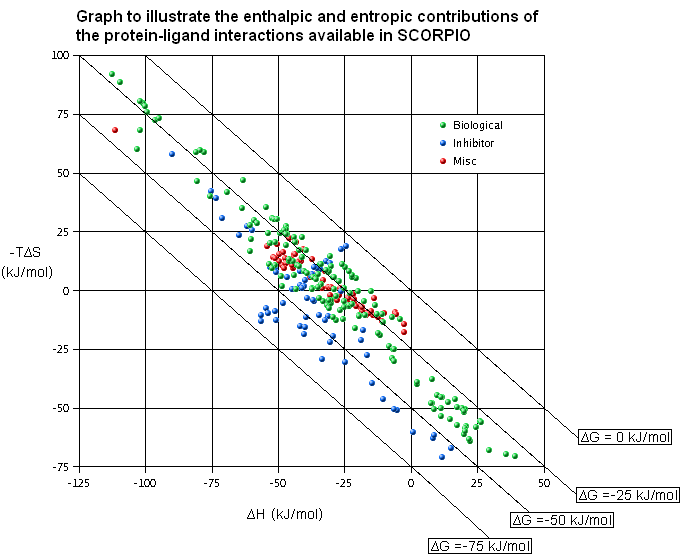 The graph below illustrates the enthalpic and entropic contributions to binding of the protein-ligand complexes in SCORPIO. The series refer to the type of protein-ligand interaction. We hope that SCORPIO will be useful to anyone trying to relate structural and thermodynamic parameters. This is an alpha release and feedback is more than welcome. This is an ongoing project and, although SCORPIO has been curated with great care, it might contain errors. If you spot an error please contact us.We take no responsibility for the data within SCORPIO, nor any responsibility for the consequences of using the data within SCORPIO. No contract, warranty or liability is implied by using the data within SCORPIO.